Spinsters and Lunatics: 4 1/2 Stars - "Wonderfully romantic and beautifully written..."
4 1/2 Stars - "Wonderfully romantic and beautifully written..."
Cataromance gave CASE FILE: CANYON CREEK, WYOMING a great review. I particularly love the quote I put above in the headline. I hope they like CHICKASAW COUNTY CAPTIVE as well. 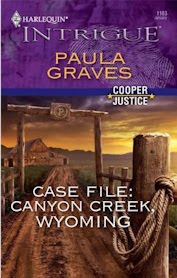 Finally, in case I haven't reminded you lately, both CASE FILE: CANYON CREEK, WYOMING and CHICKASAW COUNTY CAPTIVE are available now for purchase at eHarlequin.com. Amazon.com is also already shipping CASE FILE. And a week from today, CASE FILE should be in bookstores everywhere. I'm hoping, though not expecting, that my sales for the first week will be good enough to get me on the Borders bestseller list. It would be my first time on the list, though my last book got pretty close. I really enjoyed Hannah's and Riley's story, particularly that she saved HERSELF--repeatedly. A gutsy heroine for certain. It looks like this book is linked to 'Cowboy Alibi'??? Are any of your other back titles linked to these new ones? Anonymous, yes Cowboy Alibi and Case File, Canyon Creek, Wyoming are linked. Riley, the hero of my January book, had a bit part in Cowboy Alibi. As for links to my first three books, there aren't any in this one or in February's book, but I do have a secondary character from Forbidden Touch pop up in One Tough Marine, coming out in August of 2010. And in the September book, Bachelor Sheriff, I establish that Gossamer Ridge, Alabama is one county over from the town of Borland, which was the setting of my first book, Forbidden Territory. Who knows, we might get to see what Lily and McBride are doing these days. I do notice that for quite some time now (a year, more?) there has been a decrease in allowed words/pages. I can only imagine how much more challenging that is for a writer! I've got Feb's book on order, hope it arrives soon!